Water is the Earth's most precious resource. Until recent years, water was often overlooked as being overly abundant or available, but much has changed all over the world. As climate change, human encroachment on environmental areas, and deforestation become greater dangers, the study of groundwater has become more important than ever and is growing as one of the most important areas of science for the future of life on Earth. This three-volume set is the most comprehensive and up-to-date treatment of hydrogeochemistry that is available. The first volume lays the foundation of the composition, chemistry, and testing of groundwater, while volume two covers practical applications such as mass transfer and transport. Volume three, which completes the set, is an advanced study of the environmental analysis of groundwater and its implications for the future. 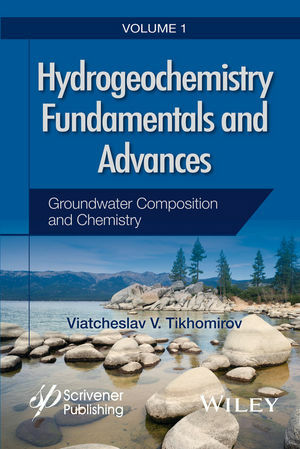 This first volume in the set is an important milestone in hydrogeochemistry, covering the fundamentals of groundwater science. It also goes further into testing methods, applications of testing, and analysis. It is not only the introductory text for this groundbreaking and ambitious new three-volume project, but it is also a valuable reference for the scientist, engineer, or student. Whether as a textbook or a reference work, this volume is a must-have for any library on hydrogeochemistry. Viatcheslav V. Tikhomirov, PhD, is a professor, engineer, and researcher in the science of groundwater and its practical applications. An associate professor in the Department of Hydrology at the St. Petersburg State University in Russia, he has taught hydrogeochemistry for many years and has over 150 publications to his credit.